As a private woodlot owner, do you recognize the values and potential in your forest? What do you want your woodlot to provide for you, your family and future generations? Woodland is a renewable and valuable resource. Picea Forestry Consultants can help you to manage your woodland properly. 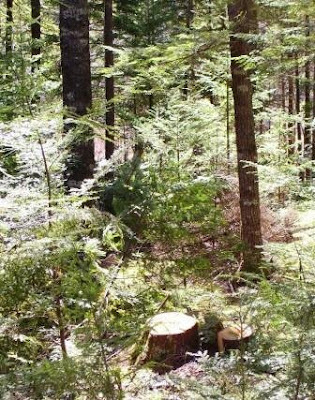 Picea Forestry Consulting & Woodlot Services offers a wide range of forest management services throughout Nova Scotia for private woodlot owners. 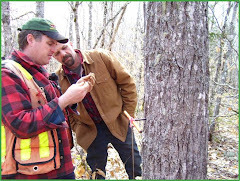 Above, selection management allows the woodlot owner to enjoy the benefits of a natural woodland while deriving periodic income from the woodlot. Picea Forestry Consulting & Woodlot Services will thoroughly assess your woodlot to identify potential and determine the best management activities to help you achieve your goals and objectives. Sustainable forest management is the key to woodlot success, and Picea Forestry Consulting & Woodlot Services is the key to management success. Above, individual tree selection in a softwood stand. This treatment encourages younger trees while promoting growth and quality development of trees in the middle and upper canopy. Picea Forestry Consulting wrote the management plan for this property, which won the Provincial Woodlot Owner of the Year Award in 2007. GPS services for accurate measurement of harvest and silviculture areas, agriculture fields including Christmas trees, etc. 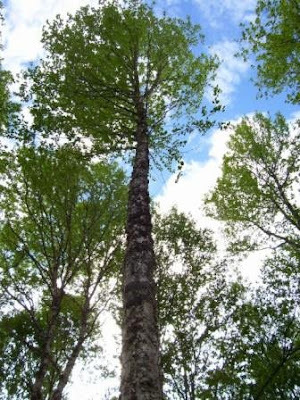 Above, crop tree release encourages the growth of potentially high-value trees such as this 40-year-old yellow birch. Picea Forestry Consulting & Woodlot Services will help you manage your woodlot from development of a forest management plan to implementing harvest and silviculture activity. We will develop a forest-management plan for you to not only improve the health and growing conditions of your woodlot but also help you qualify for the tax-deferred intergenerational transfer of your woodlot when it is passed on to the next generation. We are very flexible in the services we provide to help you manage your woodlot and achieve your goals and objectives over the short & long term. Selection harvesting: Periodic partial harvest by either individual tree or group selection, crop tree release, or a combination of these methods to promote high-quality products. This practice permits forest cover to be maintained while promoting a natural forest with multiple ages, species and heights. Crop Tree Release: Removal of trees interfering with growth and quality development of potentially high-value trees. Above, owners of well-managed woodlots enjoy many benefits, including the opportunity to watch wildlife. 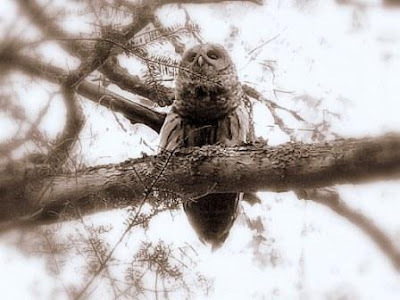 Are you interested in having a management plan for your forest? Do you want to know what a management plan is, how it's developed, what it might cost? Click here to see some frequently asked questions concerning management plans, with Trish Amero's answers. Trish is sharing her knowledge and experience on her blog. Click here to visit. Sandy demonstrates how to use an increment corer to determine the age of a tree. Photo taken near New Germany in Lunenburg County. 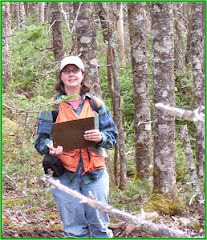 Patricia Amero, Registered Professional Forester, and Sandy Hyde, Forest Technician, are Picea Forestry Consulting. We specialize in helping Nova Scotia landowners who want to practice uneven-aged management on their woodlots. Since it was founded in 2001, Picea has written management plans for woodlots located all over Nova Scotia, from Yarmouth to Inverness. 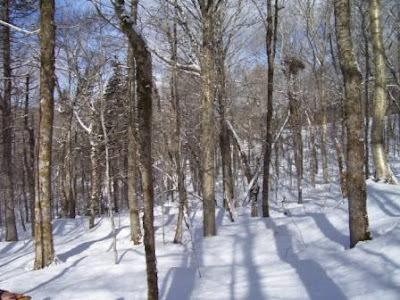 Especially noteworthy are plans for the Antrim demonstration woodlot and the late Dr. Wilfred Creighton's woodlot in Middle Musquodoboit before and after Hurricane Juan. Three woodlot owners we work with have won provincial Woodlot Owner of the Year, and Picea has received awards twice at WOYA events. We also have worked closely with the Association for Sustainable Forestry to help woodlot owners and forestry contractors access funding under the provincial Category 7 Quality Improvement Treatment Program. The photograph of Red spruce cones used at the top of this page is by Robert H. Mohlenbrock @ USDA-NRCS PLANTS Database / USDA NRCS. 1995. Northeast wetland flora: Field office guide to plant species. Northeast National Technical Center, Chester.